Golden Gate Bridge. No explaination necessary, except that it was freezing and windy I was literally wearing four layers - one of which was a snow jacket. In all honesty, I think it was in the 50s, which really isn't cold to most., but freezing to this Southern California girl. Due to that I look like poo in all of my pics, so I threw in a few of my hipstamatic shots. If you continue across the bridge and vere up to the left you'll find yourself with another amazing view, this time from the Marin Headlands. The scene from the angle provided at the top of the headlands is breathtaking. Even more amazing is if you turn 180 degrees you have a view of trees and rolling hills. It's incredible how close it is to the ocean. Come back tomorrow, I'll have a giveaway for you all! P.S. Happy St. Patrick's Day! As an Irish Catholic, it's much more than a drinking holiday for me...although it's a great bonus! Today I'm rocking these awesome Vans. Looks at the adorable clovers! You can't see, but the tags on the side and back are Irish flags. Super cute. I think I would have had a major panic attach walking on the bridge...I am terrified of heights and my stomach is turning a little just imagining it. LOL... Happy St. Patty's Day to you!!!! Great photos. Also, it made me laugh that you said you looked like poo. I used that word all of the time! Happy St. Pat's. Those shoes are SO cute. 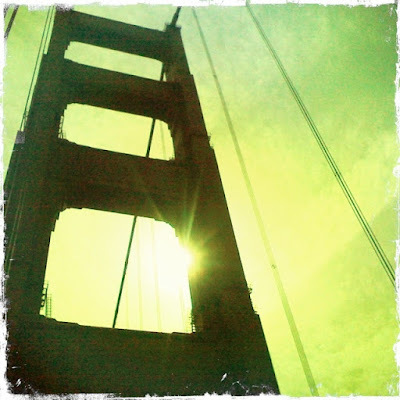 Great pics of the golden gate! I get to drive over the Golden Gate Bridge twice a week (including today! ), and I never get sick of it. I especially love coming through that last tunnel on my way back into San Francisco . . . it's such a stunning view. I always feel sorry for tourists when I see them walking across the bridge when it's terribly foggy out and you can't even see Alcatraz, haha! This looks like a blast -- I love the Golden Gate Bridge! The Marin Headlands photo is a perfect piece of nature with all of those beautiful hills. I'm glad you got to go and see the Golden Gate Bridge. You got some really cool hiptasmic shots. I hope you had a Happy St. Patrick's Day and your Vans are super cute! 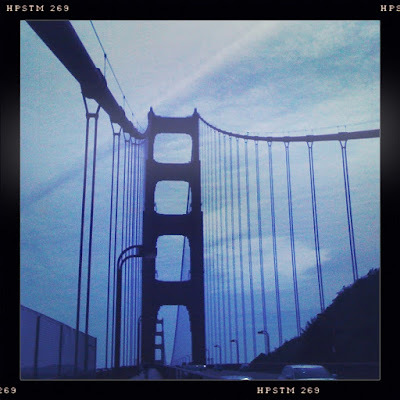 Great pics of the Golden Gate Bridge! i really need more pics on the golden gate bridge. 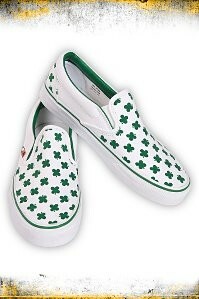 oh and those clover vans are super snazzy. I love this post!! SF is the best! Oh I've always wanted to go to San Francisco! Great pics! I love to watch fog roll in whenever i visit SF.